Having been a longstanding fan and avid user of the Lian Li line of computer chassis; I find that it is difficult to be absolutely wow’ed by another manufacturer’s attempt to overthrow the chassis king. Zalman is not new to the game, having been in business since 1999; they have manufactured products in a slew of different genres starting with quiet computing and traveling into the ridiculously priced. The GT1000 is not a bargain basement chassis but is it worth the $380.00 Price tag? Shucking the normal thin aluminum stereotype that these cases have been adorning, Zalman decided to construct this Z-Machine with aluminum almost as thick as your pencil! Each panel on this chassis is at least 5mm thick. With that said, there are cases of the same size and building material that are half the weight, but also half as strong (I can verify this… I stood on top of this sucker; I am 185lbs of pure reviewing goodness too). At first glance, the GT1000 is absolutely breathtaking (for dudes like me anyway). The chassis has a smooth industrial feel to it with hard lines and radial buttons. 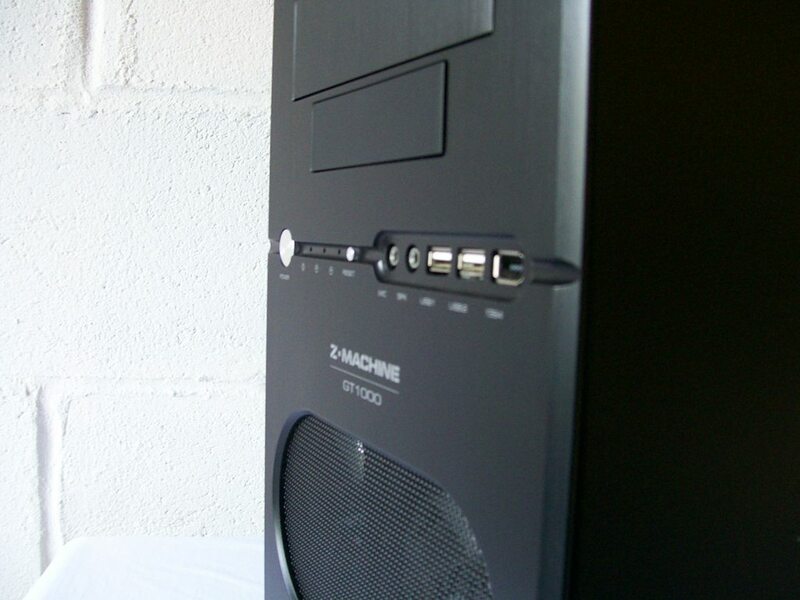 The front access ports (MIC, Headphone, 2x USB, 1x 1394) are recessed in a well chiseled gully accenting the elegance of the piece and the 92mm red LED fans give it that extra oomph. The graphics, however, could afford to be a bit less dramatic and I feel they might detract from the chassis. The two 92mm intake fans sit behind an attractive industrial mesh grill.